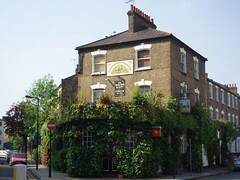 Pub in Stroud Green, set on a corner of two quiet residential roads fairly near Finsbury Park Station. It's something of a Tardis, and one might need a few visits to realise just how big it really is. Beyond the small intimate front bar, with a bizarre assortment of objects hanging from the ceiling photo, are two side bars, both quite dark; one of these has a large round table with plenty of seating, as well as some comfy little booths. Further in is a huge back room where major sporting events are shown (including, obviously, rugby matches); this large, barn-like space is lined with trestle tables and benches, and has a pool table at the back. There's also a three-level outdoor seating deck behind the pub which seemingly goes on endlessly (and is nicknamed the 'Ewok village' by some). This has its own bar, though limited to basic keg lagers. The lower level of seating is sheltered from the elements, but only offers high tables with stool seating. The upper deck has a ring of picnic tables, allowing plenty of people to sit outside when it's sunny, and rises to another level above that. They have five handpulls for real ale in addition to the usual selection of lager, draught beer and Guinness. However, on our May 2009 visit the only ale available was London Pride. The interior bar also had slightly more unusual draught lagers such as Leffe, Hoegaarden and Staropramen. When Steev visited on Monday at 7pm in August 2016, they had Sharp's Doom Bar, Truman's Runner (IIRC), and Affligem on handpump, but they managed to run out of the first two by 10pm. According to their website as of August 2016, Thai food photos of menu in May 2009 is served every evening from 6:30pm, and is cash only. They also used to do Sunday lunch 1pm-3:30pm, though we're not sure this is still the case. In May 2009, Ewan's side dish of fried bean curd (£3.20) photo was presented with an oily dipping sauce and generally lacked flavour. Kake's prawn kra prow (£6.90 including rice) photo did include a few slivers of holy basil, but was completely devoid of chilli, and the prawns tasted slightly muddy, as if they hadn't been cleaned properly. bob's red curry (£5.50 including rice) photo was perhaps the best of the lot; he described it as "slightly warming" and "decent enough". On Ewan's Sunday visit in June 2009, there were no Sunday roasts on offer, but they had some basic replacements such as rump steak or sausage sandwiches, tabbouleh with sausages, salt beef bagel, and a vegetarian option which was a pitta stuffed with roast vegetables, salad and grilled halloumi cheese (£4.50), with potato salad on the side for an additional 50p photo. This was perfectly decent, simple and filling. As of August 2016 there's a pub quiz on Mondays. toxophilite's verdict: The Faltering Fullback seems to enjoy cult status within the distinctive locale of Stroud Green, which thrives on independent businesses such as this one. The menu is usually fairly good value for money. Kake's verdict: Not a bad pub, but the Thai food seems to be heavily dumbed down for pubgoers, a shame when places like the Churchill have proved there's a market for the decent stuff. Last visited by Steev, August 2016. Opening hours taken from the Faltering Fullback website, May 2008. Last edited 2016-08-25 12:28:54 (version 17; diff). List all versions. Page last edited 2016-08-25 12:28:54 (version 17).